Imagineer is in an akward situation with Fitness Boxing in Japan. On one hand, they have a lot of customers who are upset due to the retail version of Fitness Boxing being sold out. On the flip-side, this means the retail version is selling better than expected! Still, Imagineer took the classy route and offered up an apology to potential customers on Twitter. They recommended that customers go with the eShop version of the game while they iron out issues, or if they have more patience, grab a backordered copy through Amazon. Fitness Boxing has been updated, bringing it to Version 1.0.1. While we don't have full patch notes, it seems this update might do just one thing. Players can now use the camera button on your controller to utilize screen capture when you play. This is just screen capture, and not video capture. Something is going on with Fitness Boxing in Japan. The game had a rather quiet release, but every since launch, it seems more and more people are getting interested. Not only has the game been climbing spots on the Switch eShop chart, it's now also sold out at multiple Yodobashi locations! It seems like Nintendo might have a sleeper hit on their hands here! In this photo provided by Nintendo of America, [Felia M. of Nintendo Power Couple] gather at the Nintendo NY store in New York for a Fitness Boxing workout session led by Instagram fitness influencer Niki Klasnic on Jan. 15, 2019. 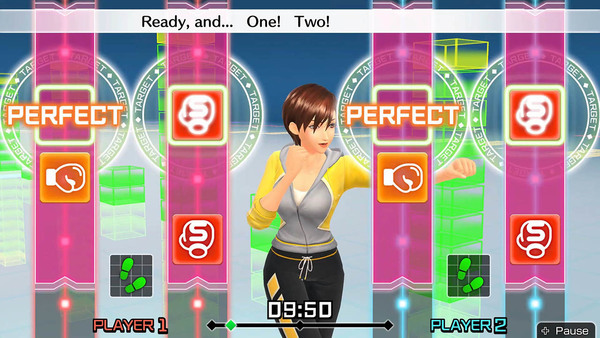 Fitness Boxing is a rhythm-based boxing game for the Nintendo Switch system that offers a variety of training options to help people achieve their fitness goals. 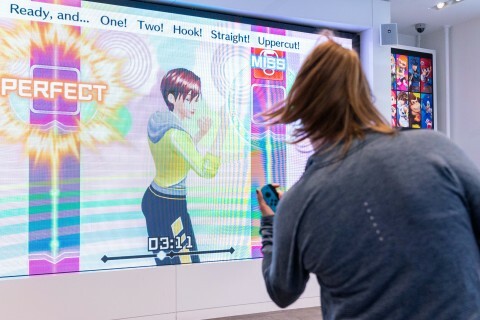 In this photo provided by Nintendo of America, [Natalie M. of Refinery29] gather at the Nintendo NY store in New York for a Fitness Boxing workout session led by Instagram fitness influencer Niki Klasnic on Jan. 15, 2019. Fitness Boxing is a rhythm-based boxing game for the Nintendo Switch system that offers a variety of training options to help people achieve their fitness goals. 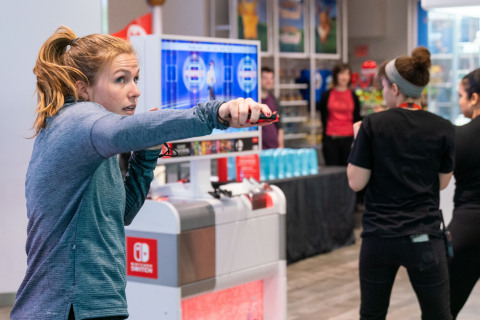 In this photo provided by Nintendo of America, Instagram fitness influencer Niki Klasnic plays the Fitness Boxing game with [Felia M. of Nintendo Power Couple] during a special event at the Nintendo NY store in New York on Jan. 15, 2019. 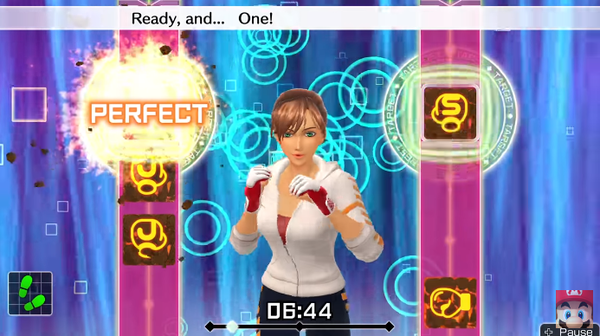 Fitness Boxing is a new rhythm-based boxing game for the Nintendo Switch system that offers variety of training options to help people achieve their fitness goals. 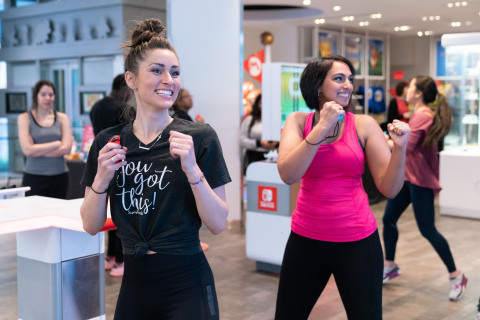 In this photo provided by Nintendo of America, [Jenna Cozzolino] and [Felia M. of Nintendo Power Couple] kick off their 2019 fitness goals during a special event at the Nintendo NY store in New York on Jan. 15, 2019, by joining a fun Fitness Boxing workout customized by Instagram fitness influencer Niki Klasnic. Fitness Boxing is a new rhythm-based boxing game for the Nintendo Switch system that offers a variety of training options to help people achieve their fitness goals. 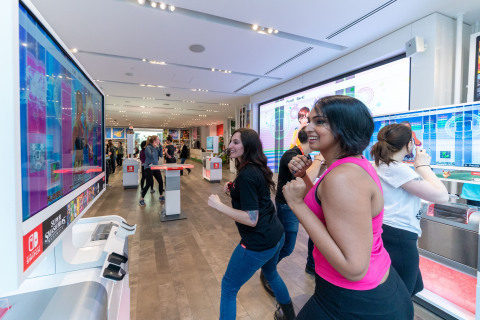 In this photo provided by Nintendo of America, [Natalie M. of Refinery29] throws the perfect punch at the Nintendo NY store in New York for a Fitness Boxing workout session on Jan. 15, 2019. 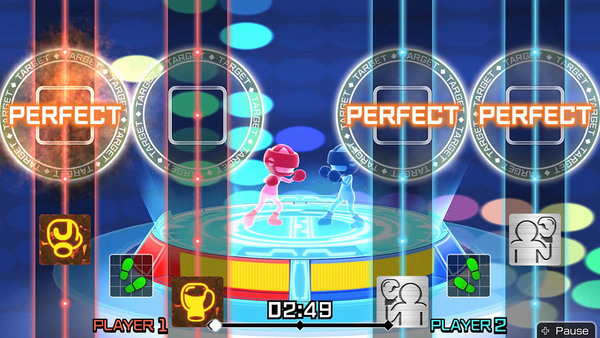 Fitness Boxing is a rhythm-based boxing game for the Nintendo Switch system that offers a variety of training options to help people achieve their fitness goals. Is Fitness Boxing's 'Teen' ESRB rating justified? The ESRB has been around for quite some time, and most of us are aware of both the game ratings and their descriptors. While people usually don't bat an eye at what the ESRB does, Fitness Boxing's rating has been causing quite a stir. For those who don't know, Fitness Boxing is a Switch game that focuses on providing a dance/exercise experience in order to help the user get a bit more active in a fun way. 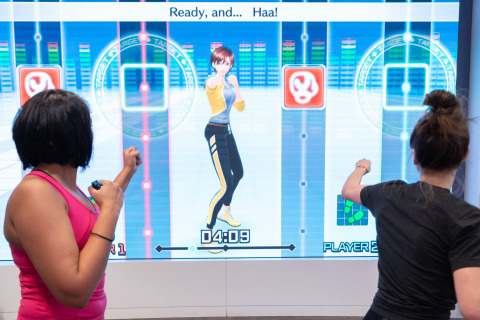 The game provides you with male/female trainer options, and your trainer choice will accompany you during your routines for instruction and encouragement. Sounds like a game that would be rated E for Everyone, right? According to the ESRB, Fitness Boxing deserved a Teen rating. If you read through the ESRB rating, you see the game marked as having 'suggestive themes.' Go a bit further into the rating and you see where that descriptor comes from. 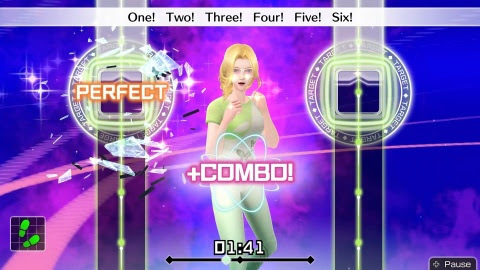 All of the female characters have breast physics incorporated into their movements; their breasts frequently jiggle/bounce in a noticeable manner during stretching and boxing routines. There have certainly been games that feature breast physics before. We most often see it in fighting games, where it's pretty obvious that the breast movement has been over-exaggerated. Our understanding is that things are different in Fitness Boxing. The breast movement you see in-game is realistic, and not designed in a sexually suggestive manner. This sentiment has been echoed by other female gamers, including DualShockers Community Manager, Audrey Lips. It's certainly an interesting discussion. The development team decided to include female trainers that bustlines of a certain size, and animated them realistically. When something like this is done for realism's sake, and attention isn't drawn to the bustline to purposefully titillate, does it warrant a suggestive themes tag? REDMOND, Wash.--(BUSINESS WIRE)-- With the holiday season coming to an end, it’s time to grab your Joy-Con controllers and hop off the couch! The Fitness Boxing game on the Nintendo Switch system is now available in stores, on Nintendo.com or in Nintendo eShop, so you can treat yourself to a fun workout wherever you want! The game’s rhythm-based boxing exercises will help you accomplish those New Year’s fitness resolutions in no time. Fitness Boxing is now available at a suggested retail price of $49.99. If you want to try before you buy (or box before you unbox), check out the free demo for the game in Nintendo eShop on Nintendo Switch or on Nintendo.com. The demo features three days’ worth of workouts, giving you a taste of the exercise routines you can easily implement into your daily life.